This week’s pocket park is actually part of a big park: Reid Park. It’s on 22nd Street just south of the entrance to the zoo. 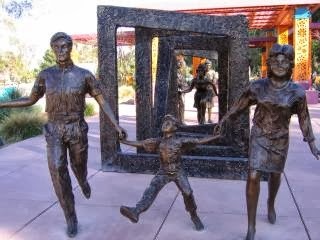 But this little plaza has so much charm… and, whenever I drive by, I hardly ever see anyone there to enjoy it. 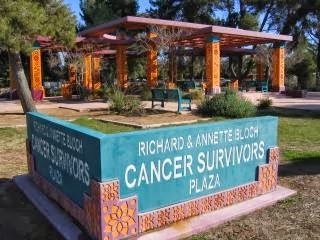 The whole name is The Richard & Annette Bloch Cancer Survivors Plaza. It’s a small plaza surrounded by greenery and brightly-painted columns, with benches for sitting and a fountain (which, whenever I’ve visited, has always been dry). 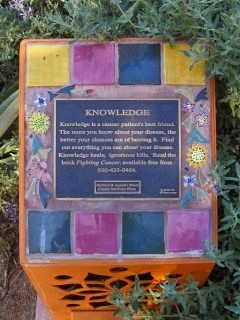 The main features are informative and inspiring plaques (if you have cancer or have had it, stop by to read these!) 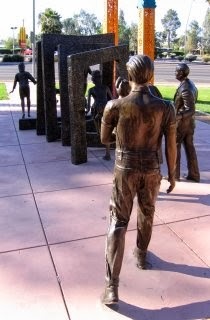 as well as the sculpture Cancer… There’s Hope by Victor Salmonfs. There’s a big parking lot just west of the Plaza. Location: 22nd St. at Lake Shore Lane (click for a satellite view and map from Google). Hours: Always ready to welcome you.